Nonprofit fundraising campaigns and crowdfunding aren’t the same thing, and we recognize your organization’s need for financial stability. It’s useful to be able to run crowdfunding campaigns for new projects and sudden needs, but sustainable organizations also need to be able to run campaigns that generate recurring, predictable revenue. CommitChange provides all of the fundraising software you’ll need to engage your supporters and raise more money, more sustainably. Most organizations exist in cycles of poverty, surviving off primarily one-time donations during appeal campaigns. Radiotopia started with this delimma when they launched on a famous crowdfunding website; then they switched to CommitChange and successfully raised over $750,000 in annual recurring donations, in addition to over $250,000 in single donations. In other words, they broke out of the cycle of poverty in one campaign by raising more recurring donations than their monthly operating expenses, in addition to having a large cash reserve. 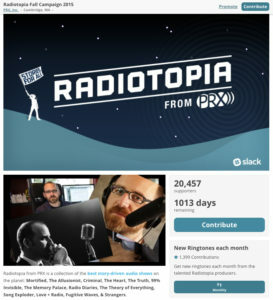 As a leader in the world of podcasting, Radiotopia continues to use CommitChange to manage their supporters and raise additional funding. We’re proud to support their mission!